"Lord, I now know and believe that every moment is incredible." My reflections share the magic, mystery, joy, and awe of this life. taken at a special surprise invitation to their after-the-concert Meet & Greet in Seattle Oct. 2, 2012 !! and this vision of Truth! Today, September 11, 2013, THIS I choose! ... Happy 22nd birthday, Gianluca! the grand finale: John Lennon's "Happy Christmas (War Is Over)" (at 45:33) ~ May it be so! Click here for more glorious IL VOLO ! Sunspots, Solar Flares, and the Aurora Borealis! ...... see for yourself the majesty and the mystery! The last few weeks have been phenomenal! - the largest sunspot in nearly 25 years! "The active region now covers 2750 millionths of the solar disk, an area equivalent to more than 16 planet Earths skinned and spread out flat. It is so large that sky watchers are seeing it with the naked eye when the sun is dimmed by low-hanging clouds or, in this case, dense fog"
spaceweather.com reported, "Both X-flares [on Oct. 24 and 25] produced brief but strong HF radio blackouts over the dayside of Earth. Communications were disturbed over a wide area for approximately one hour after the peak of each explosion. Such blackouts may be noticed by amateur radio operators, aviators, and mariners. Here is The Classification of X-Ray Solar Flares. October 26th, my friends and I experienced google maps (on both our phones) being totally erratic, including taking us in circles around the block, and telling us to go south then north then south then north on the same street! We've learned to keep one of those "old fashioned" paper maps in our cars now! Chad Blakley reported, "Lights Over Lapland is out in the [Abisko] National Park chasing the northern lights almost every single night between September and April so we have grown accustomed to watching powerful auroras dance overhead. While we have seen thousands of auroras during the last several years ... Our team has never seen anything like this [on October 24, 2014] in all of the years that we have been photographing the sky!" "'This flare was so intense that it almost shorted out my computer! Well ... not really,' says Castillo, 'but I knew right away that it was an X-class eruption.'" When I went to feed my kitties their dry food, I discovered a special message in the leftovers! This is REAL! I didn't touch it! OK, I'm seeing a pattern here! (this time the path along the river) ... Are ya smilin' yet? Thanks to all those who know and honor this Truth!
. reKindle Kindness Across America! 10-year-old Kaylee Hooley and her single dad co-founded reKindle Kindness ... delivering backpacks of supplies (and electrolyte drinks on hot days) to homeless people across America. Videos of their efforts inspire others to do the same and achieve their dream of ending homelessness. I donated the first $11 to their fundraiser for supplies to assist these beautiful people to reach out to our neighbors like Albert. Moringa Trees... Nutrition where we need it! Playing for Change ~ music to change the world! ..You graced our hearts with out-of-this-world laughter, surprising wisdom, and spectacular brilliance! ..Wishing you peace, fun, and love even beyond what you felt with Koko! What a precious soul he is! Here are some photos taken 1 "block" from the old Carbonado Ranger's Station. Click here for more info, photos, and a global project! A friend and I will be at the Newmark Theatre Sunday evening, June 22, experiencing Ethan's humble magnificence in person! I am so excited! If you haven't seen Ethan's latest (2nd!) PBS Special, it's called The Power of Music, and currently the number 1 PBS Special, I'm sure it will be aired again. The most awe-inspiring for me was between 28-33 minutes into the presentation, when, after inviting the audience to share an experience, Ethan listens to a story from a participant and composes a tribute song on the spot. WOW!!! His composition was seamless, complex and gorgeous, expressing the emotions of the story. How does he do that?! Besides being an amazing pianist (since 3 years old) and composer (since 5 years old), Ethan has a huge heart and uses it to support our world, especially children. As of this spring, Ethan has raised 35 million dollars for charity. That's not a typo! And, more important, his music, his spirit, his dedication are inviting each of us to "believe in yourself" and know that Truly "Anything Is Possible." "Ethan Bortnick is a gift to our planet, especially children and music-lovers. This is a sweet and inspiring story which beautifully show-cases Ethan's gifts as well as societal concerns worthy of our loving support. Anything Is Possible emanates wisdom and hope of value to all ages. As Einstein said, 'There are two ways to live your life. One is as though nothing is a miracle. The other is as though everything is a miracle.' Ethan, I'm with you. Anything is possible! ~ Jeanine DuBois, Compassion's Doorway"
Ethan, I am so grateful to you and your vision! From my perspective, it totally dove-tails with my own. P.S. Ethan was the youngest performer in "We Are the World 25 for Haiti", along with many artists, including IL VOLO representing Italy. So, friends, if you decide “Oh, I must go hear Ethan!” a friend and I will be in the 1st balcony Box ~ Let me know if you plan to attend! Ethan, his band, Damian McGinty, and the Shine Children's Chorus were fantastic! Upbeat, humorous, heartfelt, musically beautiful, and inspiring! Thank you, Ethan and friends! We feel so blessed to have joined you for this sweet evening! A few more days and you'll have some time to relax (I hope that's the plan) before the fall leg of your tour. With awe and gratitude to you, Ethan! Another delightful walk in Foothills Park. I found amazing cloud formations. Today, May 18th, is the day Mount St. Helens erupted in 1980, also on a Sunday. It blasted about 17 miles to the NORTH, created huge mud flows. Anyone 17 miles north of the mountain was killed, even one couple 25 miles away. Thankfully, many had evacuated the mountain area, although 57 died that day. I was at a cabin retreat with a handful of friends from church that weekend. That morning the owner of the cabin was out rowing on Lake Merwin (17 miles SOUTH of Mount St. Helens) when the volcano erupted. Even she did not hear the explosion. According to History Link, the sound shot straight up and then bounced off the upper atmosphere and was heard about an hour later at the coast, in King County [Seattle area], in Canada as far as Saskatchewan, and other distant places, but not by those of us close by. 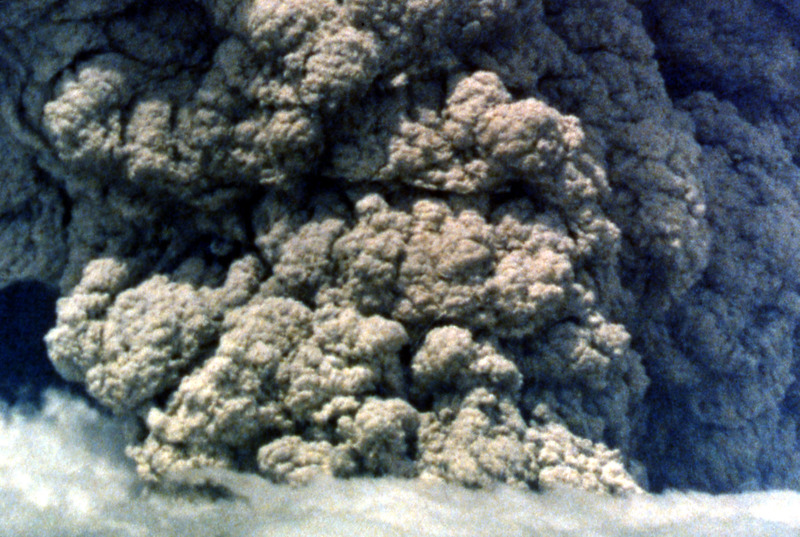 Oblivious to the eruption, we were about to sit down to breakfast when a sheriff came to our door and asked if we knew that St. Helens had erupted. We said No, and he said we needed to be watching the television, that we didn't need to evacuate yet, and he would return if we needed to leave. For whatever reason, we didn't turn on the TV but rather sat down to breakfast. And those who had planned the retreat played a song for our pre-breakfast meditation. The song title (following the theme of Psalm 46) was "Though the Mountains May Fall." Sing the praise and the glory of God." Wow. I don't remember if I had tears then, but I do now and every time I remember that day. After eating, we packed up, and decided to go see what the mountain looked like. There was a huge dark mushroom cloud, and it was very muggy, actually steamy. And still, we didn't think we were in danger. As we felt the steam bath and watched in awe the dark billowing, a guy came along on his dirt bike motorcycle and asked if anyone wanted a ride on the back roads of the mountain. Becky eagerly hopped aboard, and off they went. They came back in several minutes, and the guy said he thought maybe he shouldn't do that any longer. A couple minutes later a police car drove up and said we needed to leave, and the officer closed the road. <http://www.historylink.org/index.cfm?DisplayPage=output.cfm&File_Id=5457> the north side of the mountain lost almost 30% of its height, and overall the mountain went from being the 5th highest mountain in Washington state at 9677 feet, to the 30th highest at 8364 feet, where the mountain lost the least elevation, 1313 feet, to the south. Thanks to <http://mountsthelens.com/history-2.html> for this image of Mount St. Helens and Spirit Lake pre-1980 and in 1982. We finished our drive home, and when I arrived, I discovered that my roommate and family in California were extremely worried because they knew Mount Saint Helens had erupted. Yet we had an utterly peaceful and awe-inspiring day. Months later, when I drove north up I5, along the highway where we had driven home on May 18th, 1980, I saw the mud lines on the trees, I believe about 10 feet high. We had no idea, as we chatted on our way home, that a literal mountain of mud was flowing behind us, knocking out bridges and eventually emptying into the Columbia River 75 miles from the mountain. Here is a photo from USGS near the Toutle River, where the mud lines were, of course, higher. You get the idea. If we had been on our retreat 17 miles north instead of south of Mount St. Helens, I would not be alive to tell this story. due to the extreme contrast with the solar brightness. which are inside the halo but not beyond it. Near the red with white dot, is green and more red. nature is shimmering with the miracle of Life! sending shivers of refreshment and delight up and down my spine! while it hides the lotus petals of Love in my camera's lens. Of course this solar halo inspired curiosity in me. "The great turning is upon this earth. What some call the tipping point has occurred. And it has occurred towards health, towards freedom, towards love, towards sharing. And so, energetically there are those, some angelic, some what we can refer to best as light beings, some who are in spirit in other dimensionalities, that are working with this earth, and they are weaving all that is being expressed by those in fear into the higher frequencies of love. And this of this circle around the sun, this halo, is such a blessing of that which is given. As halos have always meant spirituality. As we have been speaking of the frequencies of the Great Central Sun coming through the portal of your sun. As you look towards this halo, beloved, there is love pouring out. Allow it to uplift. And receive in your heart the halo, beloved one, so that you feel that there is a halo also around your heart, a halo of life, a halo that you can draw upon, a halo of reassurance, a halo of attraction of all good things, of love and ease and the beauty of nature, and the remembrance of God in form and in Spirit. ..."
I am sharing these photos and noticing the Times the photos were taken! 4 is my symbolic number for the heart, because it's the 4th chakra. Check out the times of the photos. 4's everywhere! May 12 update (2:22pm PDT)... Below are the photos taken around 1:50 to 2:00 pm PDT. I needed something to block out the sun, so I held up the rose (shown at the end, so you can see what it looks like without the solar halo). If you see a solar halo, you can help us expand our observations by communicating with me via my Contact Page and letting me know the date and time and location on the planet when you are seeing the solar halo. I encourage you to take photos, too! I love Einstein's quote, "There are two ways to live your life. One is as though nothing is a miracle. The other is as though everything is a miracle." You know which I choose! And those 2 days in the park, I saw no one else looking at the sky and marveling, until I pointed the halo out to them. Then they, too, were amazed. May we all discover our eyes to see! and for finding the sweet blessings meant just for you! I took these photos in Lake Oswego, Oregon when I discovered this incredibly large and amazing halo completely surrounding the sun. The photos above were taken with my iPhone 4 using no modification whatsoever, just point and click. This solar halo was noticeably visible on 4-28-2014 from 4:04pm until 5:01pm when I took my last photo of the day. When I returned to the same area on 4-30-2014, the halo was again visible at 7:34pm. This is the first time I have ever seen a huge halo around the sun. For all but the one, I used the trees to block out the brightness of the sun, so I could look at the image while taking the photo, and so the halo would show up in my photo, and not be overshadowed by the brightness of the sun. however, the eclipse was not occurring when these photos were taken and was not visible in Oregon. The eclipse was visible in Antartica several hours later. If you're interested, here is more about the solar eclipse on April 28/29 2014. I Won't Give Up ~ Thanks, Jason Mraz! and this Mraz song was used with one of their videos. I was hooked! I just purchased this on iTunes! Of course, there are many ways to interpret this song. Feel free to find your own. I felt... tears, awe, surprise, amazement! 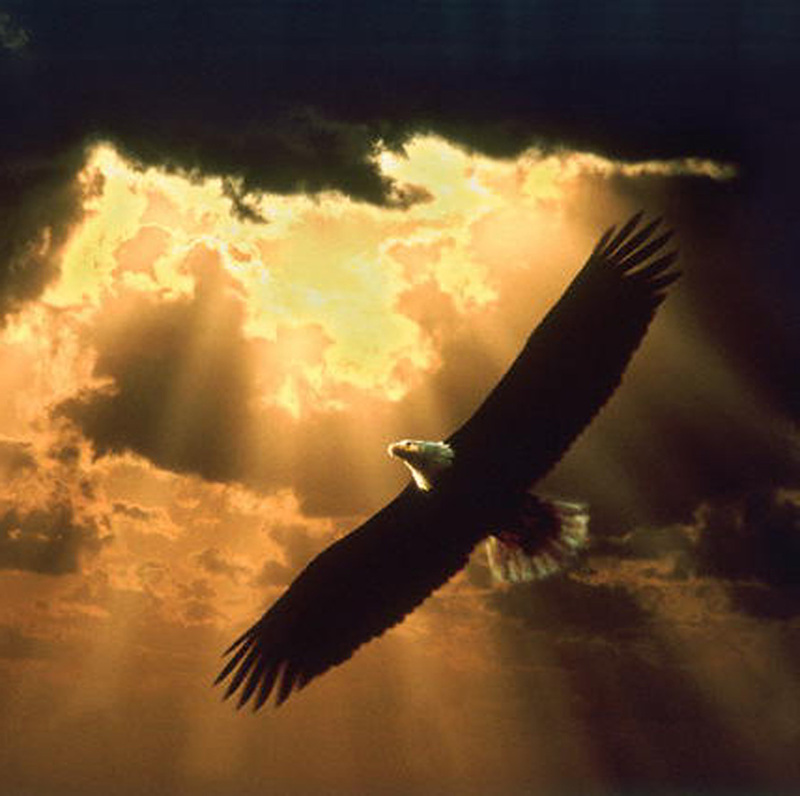 Is enlightenment, respect for all Creation, freedom NOW that surprising and yet that close? My deep respect to you and your expression of Truth, Clint. May all 940,710 views in less than 2 months represent people who are living and speaking their Truth. "Read critically. Write consciously. Speak clearly. Tell your Truth." Rohan Herring touched my heart with his beautiful voice, heartfelt expression, and courageous experience. And a beautiful article about this performance: "Rohan Herring's X Factor song touches hearts" by Joshua Butler. “Life is too precious, too short to second guess yourself,” he said. I hope he cuts an album. He deserves the recognition, and we deserve the gift of his voice and heart! My sister knows a 25-year-old who is recovering from a lifelong health condition after receiving a transformative kidney transplant. He is a daily inspiration to my sister and so many others. As a trainer at her gym, he has uplifted my sister's health and joy in life. I believe HE can fly and is helping my sister to soar into ever greater well-being. I dedicate this song to Stephen with prayers for growing, glowing health! and to my sister with love! with thanks to God for daily miracles. "I like to believe that people, in the long run, are going to do more to promote peace than our governments. Over the decades I have become familiar with the blessings of transformative healing and the teachings I receive through these experiences. From my perspective, they are a joint effort on the part of my body, God, my Soul Self, the Universe, Life itself. You may have read below tidbits about my eyes regaining all my peripheral vision after glaucoma and about other visual elements improving. I've had many experiences through the decades, and I've decided to chronicle them and the teachings that have blessed my life through each experience. This sharing is unfolding here. Happy Birthday, and deep gratitude to you, Martin! We remember you and are so grateful for your legacy. and includes what I TAT'd on and how the day unfolded after that. I have this picture of "today's" date on the calendar being added (appearing out of "thin air") on the calendar each morning, as we choose the unfolding of that day. In the calendar comment, I meant that there was no stuck residue left pre-dictating future days. Maybe that's what the Mayans meant by the end of "time." Ahhhh... wouldn't that make it always NOW?! "had this visual of dear Lisa leading the little children by the hand into the Light. No wonder she decided to stay on the other side. I know she is doing good work there and so needed and loved. Love to All and to our Dear Lisa who continues to do the work of the Angels. I am so grateful for your sharing, Michele! I received your email at 3:33pm, and 3 is my number for God, for "Whatever-Makes-Flowers-Grow", as Tapas says. It feels like a message "Yes, this is Real!" coming from God and Lisa. Thanks to Lisa S's friend Lisa V for this compilation photo! I see wings of Light or a crown chakra & a dove of Peace around Lisa! Today I saw my acupuncturist, Jasmine Patel MSAOM, LAc, who had been praying for Lisa, and also whose work contributed to my regaining my peripheral vision after glaucoma. I told her of Lisa's passing, and she shared with me about the book Proof of Heaven: A Neurosurgeon's Journey into the Afterlife by Eben Alexander, M.D. (#1 on the New York Bestseller's List). Right after that, I mentioned what a lovely smell there was in the treatment room. She said it wasn't anything there, and neither of us were wearing perfume. Then she said it was the smell of a flower. Jasmine didn't know that one day last week when I smelled unexplainable cigarette smoke in my house, I told my two deceased friends who had smoked that I wanted them to choose a nice smell to get my attention... for J his luscious home grown cherry tomatoes, for B his special incense. Then I thought of Lisa and said she could choose; she chose the scent of gardenias. I tried to tell Jasmine the name gardenia and couldn't think of the word. Jasmine finally said the smell in the room was of gardenias! I just sat by the fire and read the entire book Proof of Heaven in one sitting tonight. I highly recommend it (along with Anita Moorjani's Dying to Be Me). You can also see many interviews of Dr. Eben Alexander on the Internet. Today I was blessed to be participating in a TAT® on change, part of Sara Arey's amazing series on Clearing Fundamental Fears. Early on, I had this thought, "Being comfortable with change is being comfortable with the present moment." I choose to be in choice ("at choice") always. I choose to feel and know that my choices are good and that you, Lord God, are with me in my choices. You Gave me free will, and I choose to graciously and gratefully accept your gift of choice. I am grateful that my choice is not harmful to anyone. It is simply my choice. I do not live in a world where my sincere, centered choice conflicts in any way with the good of anyone else. I choose that all is Love. their own way of learning and healing and being. there is no one way. There is only every way." Positive attitude and hope are important. And it will take all of us speaking for truth, freedom, respect, safety, and love to see what is undermining, and then to draw a line in the sand. We the People... have had enough of that which is not democracy, which lacks truth and respect for all! • Wow! more amazing developments with my eyes! This time I saw my doctor of optometry for my yearly check on my eye glasses prescription. I chose to go without my glasses for a day and a half, to allow my eyes to relax and come into their current natural vision, rather than my eyes dealing with the constriction and possibly strain of trying to meet the glasses prescription. (This is recommended by natural vision enhancement specialists, not something I personally am trained in, but which I apply for myself.) During this time, I also did TAT, Positive Points Palming (from Vision Gym of Brain Gym®), other poses as I felt led, talking with my eyes, and visually observing how much better I could make out images across my room in 2.5 hours' time! My vision used to be approximately 20/1000 without corrective lenses, and over 3 previous prescriptions had come down to 20/875 (-8.75 diopters) and 20/825 (-8.25 diopters). So, here is the current (4th) improvement in my lenses. My new glasses (now on order) are set at -7.75 and -8.25, a half diopter less in each lens. I'm also celebrating major improvement in astigmatism: right eye from -75 to none!! Left eye from -50 to -25. And the presbyopia / reading glasses vision called "Add" went from +1.75 to +1.5, a .25 improvement in close-up reading ability. Here's a site that explains all those numbers on our eye glasses prescription. I'm going to save the details of the story behind the story for my my TAT® for Vibrant Eyes and Vision group and personal friends. And I wanted to celebrate my joyful news with all of you! So, as I proceded with my glasses at half a diopter less in each lens, I found that I had misinterpreted how quickly my vision was improving, that my distance acuity was not as strong as I wanted for my current vision. So I went back to my doctor of optometry, we re-checked my vision and decided that a quarter diopter less in each lens (still a great improvement!) was more comfortable for my current vision. Thankfully, both my doctor and the lab that made my lenses have a policy of allowing re-vision of lenses up to 90 days after the initial pair. I encourage you to check with your doctor about such a policy, especially for those of you who are finding improvement in your vision, as I am. I now can easily and comfortably see great distances with my revised lenses, and I'm grateful to my body and eyes for their continuing improved vision. Also, for what it's worth, my reading vision and astigmatism still reported the dramatic improvement recorded in September. As a certified TAT® Trainer and Professional, we learn to remain Present as we facilitate TAT. This Presence is a huge factor in the gracefully transformative experiences I have had and witnessed in others through TAT. And I remember so well when my dear friend Leslie was fully present with me while I was feeling some deep pain and sadness. I felt so welcome to just be with what I was feeling and be OK with it all. What an incredible gift! Before our visit was over, I experienced a complete shift to a place of peace, as if I had done TAT. Pure Presence made that possible! Songs that Make My Heart Sing! Lots more of IL VOLO below by the hot air balloon. And they were out of this world in their concert in Seattle!! Check out <http://www.celinedion.com/> including a charity link about Celine and René's support for Cystic Fibrosis Canada. Sky in the Road are local to the Portland area. I love to see them in concert! Check their shows link on their web page to see what's up next! "I Bring You to My Senses", a new Diane Warren song, sung by IL VOLO on their spectacular new CD We Are Love. Check out IL VOLO's site <http://www.ilvolomusic.com/news/default.aspx?pg=2> for a link to purchase the CD, or go to iTunes. Choose the Most Empowering Interpretation! Tonight I'm getting to consciously put this into practice. I was very much looking forward to watching fireworks with a friend whom I haven't seen in quite a while. It turns out that she needed to cancel due to her dog's reaction to fireworks. With my love of animals, I understand completely, and yet I feel quite disappointed. I'm grateful that this quote from Divine Grace popped into my mind: "Choose the most empowering interpretation!" So now I am choosing to believe that my friend and I will have a lovely visit soon (which I'm sure will happen) and that our plans were somehow, as my friend Laurie says, a placeholder for something magnificent and delightful that might not happen otherwise. I love to watch fireworks in a peaceful setting, and I'm fully capable of doing so by myself if it's too late to make alternate plans, but this is a time in my life when connections with friends and loved ones, familiar and new to my life is incredibly important. My heart treasures sharing the fullness and joy of life. I don't think I've ever asked for prayers on this page, so I guess this is a first. Please hold me in the Light for my heart's desires to be fulfilled. I know that will mean joy and fulfillment for all involved. Thank you so much. Sooo... Thanks to two friends sharing their evening plans, I was invited to go to a lovely picnic and spiritual song fest and then to watch the Lake Oswego fireworks. It was relaxing, with lovely uplifting connections. And, I am considering attending the July Wednesday night Heart of Compassion series. With a business name like Compassion's Doorway, it sort of felt like a "Hey! Psst! Over here!" (; >) I am grateful that the most empowering interpretation was well founded. And I'm gonna really stretch out here and ask for continued prayers for my heart's desires to be fulfilled. It's been a long time since my husband died, and I'm ready to move on. So now you know one of my sincere desires. I am trusting you to hold it with love and respect. So I made it down to the local Arts Festival (in the park), which is a must see for me each year. This year I found a new treasure! Dan Elster's photography is alive with the authenticity of wild animals in their natural habitats, experiencing life as it is. I'm astounded at each unique image... vibrant, stark, colorful, surprising, majestic, cute, powerful. Owls, foxes, sea lions, herons, eagles, gulls, ravens, otters, hummingbirds... Doggone it! I'm at a loss to give you the slightest clue as to how wonderful, amazing, and diverse Dan's images are. You've just gotta look for yourself! It's worth dodging the raindrops. (Dan's tent is at the south end of the exhibit). You'll also see Dan's schedule of shows on his site <http://www.elsterphotography.com/>, and you can purchase anything from cards to a variety of affordable sized and prepared images (see "stuff"). Dan's archived newsletters share amazing background along with his vibrant images. Thanks to Dan Elster for this window into his amazing photography! Dan's story about his professional transformation is delightful. Really hard to imagine that Dan is mostly self-taught in his photography. I thoroughly enjoyed his authenticity, transparency, respect for nature, and more in chatting with him yesterday about his work. Take the time for this vacation into nature in a way that most of us might never experience in person. Thank you, Dan, for being an awesome tour guide into the wonder of nature in the wild! Gratitude to Dan for sharing his gift with us! Consider supporting his work with a purchase. I'm delighted with mine! • A Joyful Path to Health ~ What Makes YOU Come Alive?! Blessings to ALL of us as we come alive each new day! I have interesting responses to material like Wayne Dyer's highly respected Wishes Fulfilled. Both knowing it's true from many great teachers and almost feeling like singing in the dark. But then I remember 27 years ago when I was sick for 5 months (virus then strep then bronchitis then pneumonia then virus without a break). I started to feel like I would never get well. And, for some reason, I had this thought to thank God (express gratitude) every morning in the shower for the parts of me that felt well. It pretty much started with things like my hair and my big toe and eventually progressed to my arms and so on until I was all well. It was actually a short road back to health once I started this process. And I believe, to become vibrantly alive, having something each day that makes us "come alive" / sparkle / glow with joy and gratitude is the key. Maybe it's music. Here's a song called "When You See Forever" that lifts my spirits and revs my day. Maybe it's seeing baby deer out your window (Wow, Lisa!) or snuggling with your lovey cat or smelling redwoods or feeling the breeze toss and tickle your hair or hugging a loved one or smelling onions grilling or having eyes to see the "every day" beauty of nature. You get the idea! As Lisa said in her Caring Bridge Journal entry on May 23, "Please join in supporting my vision of total restoration of my health and well-being!" See the video for my sharing about Lisa. <http://www.compassions-doorway.com/Jeanine_reflections.html> to get the word out to others about Lisa. And below is the beautiful heart cloud that celebrated the day (March 26) Lisa went home to her space in the redwoods! Blessings of gratitude and joy to all! On May 26, 2012, Lisa wrote in her Journal update, "I so enjoyed watching the whale video [http://www.youtube.com/watch?v=tcXU7G6zhjU&feature=related] – such a beautiful story and to have it recorded for all of us to be inspired is incredible.... the joy expressed when that humpback leapt through the air is about as close to capturing how I felt that day I came home, as anything I've seen!" Today I was in the bank, and a woman was trying to get out of the store's motorized cart to go stand at the bank teller window. She had her cane there, and I could see she wasn't quite sure how to stand up. I just came over and said, "Can I help?" And she let me put my arm out, so she had something to hold onto while she pulled herself up. I walked her over to the closest window (thankfully, there were no other customers in the bank), and I could see she was in pain, even just to stand, so I said loud enough for several tellers to hear, "Is there any reason you can't sit down?" (There is a desk and chairs where folks sometimes meet with a teller.) Thankfully, the bank clerks got my drift, and they offered for her to sit at the desk. I told the woman that I would be nearby, and I would be back to walk her to the cart. I kept an eye out from a distance, and then came back right when she was ready. She struggled a bit to get up, and she indicated she was really hurting. I said it looked like pain was a factor, and that I'd been in pain, so I understood. After she was back in the motorized cart and headed towards her next task, I mentioned that I hoped she would let someone help her to her car when she was ready. I was so pleased to hear her say that she was going to drive that cart right to her door and let the store personnel put it away. And we parted with smiles. This woman in the store made my day! It was such a simple thing to offer her my arm. No big deal. And yet, I would feel so tremendously blessed if I were near my friend with spinal cancer and able to help my friend in some way, able to do something small, yet so very important. It reminded me of something another friend used to speak of. His son was having some serious personal challenges and was not around to receive help from his dad. Nor did his dad believe that his son really could hear what his dad wished to offer. But this friend told me how he prayed and trusted that someone would be there for his son, someone whom his son could truly hear. And every time my friend was able to help a stranger, he knew he was being a blessing to that person's loved ones. I am so grateful to all those who are there for my friend today. And my gratitude to this lovely woman who brought me such joy in just a few minutes. What a blessing that we are not alone, and that we can give and receive love where we are. Just for today, we can let that be good enough. A beautiful night in the park at dusk. Oh, look how pretty that lamp post is with the trees nearby. 1st photo ~ What is that red thing? Is it a light shining from behind? If I move, do I still see it? Oh well, it's still there, and I want to take this photo. Downloading my iPhone photos to my computer... Oh, my goodness! There's more. Lots more! 2nd photo ~ taken 10 seconds later; red moved and is now translucent (and appears to have more intense green below the red); now that I can see on my computer, I see the red petals effect from the white lamp post light. 3rd photo ~ taken 23 seconds later ~ Wow! the petals are really showing up now! (I took a photo identical to #2 between 2nd and 3rd photo.) And I thought I was just taking a picture of a pretty scene with a lamp post and trees and flowers! 4th photo ~ I walked further down the path, took 2 photos before this scene (51 seconds after the bright petals / 3rd photo, then 9 seconds after that), and then this snapshot 12 more seconds later. The red wasn't in the other 2 photos of this scene, and now here it is again! So, I'll bet you're as curious as I was about what the heck I saw and what showed up in my photos. I can tell you that I was in a delightful mood, filled with gratitude for life right before and as I was taking the photos. I didn't have any uncomfortable feelings. When I saw these photos, especially the first, I was really wondering what I saw, especially since I saw it with my naked eyes, and it showed up in the photos, even more than what I was aware of while taking pictures that night. I wanted to know what this really was (so my imagination didn't go wild). So I asked Divine Grace (a group of angels who speak through Peta Lynne) <http://bydivinegrace.com>, and they surprised me with a very sweet explanation, which makes total sense in light of the other experiences I've had with beams in the sky, sky paintings, and orbs. Rather than watch 4.5 minutes of snippets of the film with the YouTube song, I encourage you to listen, but save the visuals until after you've seen the film, so the video clips don't give away some of the best moments in the film. The Perfect Game was endearing and engaging with great themes, hope, humor, fun, and totally a film for all ages. I highly recommend the film, and I personally enjoyed the sound bites from actors, director, and more. Wishing you blessings of harmony and joy! Wow! What a magical moment after a mere quarter mile walk to Upper North Falls in Silver Falls State Park, Oregon. Of the 16 photos of the rainbow in the mist, this one felt utterly magical, a painting in nature, and yet, it's simply a point and shoot photo from my iPhone, without any adjustments. Here's the double rainbow by the falls. Soon I'll add a link to more photos and possibly videos. I love coming home from a glorious day reveling in nature to find treasures in my iPhone beyond my imagining! Heart Cloud Heralds Friend Lisa's Return Home! My dear friend Lisa has been dealing with stage 4 spinal cancer, has shown amazing progress, and yet, she needed to be moved to a county facility for hospice. Lisa's first spoken wish when she was diagnosed in the hospital (end of January) was to be able to heal in the serenity of her home in the redwoods. She has also wanted to be with her beloved cat, whom she hasn't seen in these 2 months. While there have been many day-by-day miracles, the latest round started with Lisa's friend Dawn initiating a YouCaring site to raise money for the skilled LVN care necessary for Lisa to go home, even for a few weeks, if not a couple months or more. I was so touched that there was this hope for Lisa! So... I was lounging in the Oregon sun (!) just about to start reading Anita Moorjani's book Dying to Be Me (see light blue book image below for Anita's near death experience interview and website) when I read in my email that Lisa is going home at 4:30 today!!! Tears of joy and gratitude poured down my face as I called to tell a dear friend the amazing news, and then I saw this cloud as the phone was ringing. Sure looks like a heart to me!!! Prayers for Lisa's highest good and deepest desires are welcome, and if you or someone you know feels led to donate to Lisa's time at home, that is most welcome, too. Love, Love, LOVE and welcome HOME to you, Lisa!! Even the clouds danced into a heart formation for you!! So, just now when I got home, I checked my email and discovered what today's Bone Sigh <bonesigharts.com> said. I have NEVER seen it say something like this before! Stunning timing. Reminds me of the saying, "Coincidence is God's way of keeping his anonymity." And, on top of the topic, I just got the "coincidence" of the name Bone Sigh. Hmmm... You got a lotta loved ones in high places, Lisa, from heart clouds to strategically timed messages! while another had grown solid and real. clouds of peace surrounded it. and forgiveness dwelled among it. Oh, my gosh! I just remembered that the amazing woman who created these Bone Sighs is named Terri St. Cloud. I hope you're getting a cosmic wink and a good laugh from all of this, as I am! Big hugs, lots of Love, and thanks for letting me delight in all your little welcome home love signs, Lisa! <http://www.bonesigharts.com/quote/349-welcome-home>, here's what I read from Terri St. Cloud. It seemed like one more gift from this day, so I pass it along. "Once upon a time, I was told that I couldn't do it. That I shouldn't dare. That the dream was too risky. That the risks too scary. The only people behind me were my three sons. And together, my three sons and I built a dream. Can you imagine building a dream with your sons? There are days I feel like the luckiest person alive. And that feeling has its roots in the darkest time in my life. How's that for something to think about on those dark days? Gold is found in that darkness. Gold that you don't even know exists. Hang on to that thought ..."
On February 16, 2012, I had the blessing of a conversation with a group of angels called Divine Grace, who speak through my friend Peta Lynne. <http://bydivinegrace.com/> Here are some treasures from our conversation. I thought to myself, "Look, Jeanine, you can learn great lessons by love because I want that in my life. I don't want to learn lessons at this point anymore through pain or suffering or confusion or overcoming. I want to learn it through the dance of ... love." ... there is no greater learning than the learning to choose joy." Divine Grace continued later, "You are not going to let anyone make God that small.... Everyone has their own path, their own way of understanding, their own way of learning and healing and being. So, as you very well have held fast to through your life, there is no one way. There is only every way." And later they added, "We like to say that if you were in a completely dark room of which you had no idea of the size, and you felt like you had to see and feel and resolve everything in there, you would never know if you were done. So it is much simpler just to turn on the light. And when the light turns on, all of the darkness is dispelled. And so, it is always our perspective from here to just turn towards the Light, and as you say the flow, and let the flow carry you. And it is generally not by examining that which is the blockage that you are freed, but it is by seeing the perspective that makes the blockage unneeded, unnecessary, and not chosen. ...As you look towards the Light, the shadows are behind you. ...It is much more about recognizing that if you stop thrashing about, you can float. If you trust, you find yourself in that frequency where the trust is not only justified but rejoiced in." Wow! So beautiful and insightful! I also found that Divine Grace's comment about "seeing the perspective that makes the blockage unneeded, unnecessary, and not chosen" reminds me of what happens in TAT®, a tool I am deeply grateful for. Comin' Alive with Love and Passion! Perhaps another angle that it makes me think of might be a little controversial, but I'll share it anyway. Recently I had the extreme honor and pleasure of speaking with Divine Grace, a group of angels who speak through my friend Peta Lynne. <http://bydivinegrace.com/> I was sharing about a lovely experience in nature, driving through snow dusted evergreens that felt so uplifting and nurturing. Divine Grace's response was that the best thing we can do for the planet is to LOVE Creation, even more so than to try to rescue creation. I understand that may be a new idea for many of us. And yet when I think of how this concept applies to people, I begin to understand. Loving people helps them to blossom into the magnificence and power of their true selves, which is beyond our imagining. Whereas trying to rescue people implies they don't have the strength themselves and can even diminish them. Clearly, loving is more empowering and supportive than rescuing. Friday, January 27th I had another Visual Fields test regarding glaucoma. I had asked (in my Quaker Meeting) for prayers for God's guidance of the doctor and me and prayers for my body-mind system to work together with God's grace for my highest good. Thank you to those who have offered positive support, whether recently or in the past. Whether TATs, prayers, love, faith, friendship - it's all good! Here's my amazing and heart-warming news. Last time (3 months ago) the ophthalmologist was surprised that my eyes had not gotten worse in 14 months without glaucoma drops (with acupuncture, specialized tea, and Chinese herbs treatment, since I have an adverse response to the glaucoma drops). The ophthalmologist even said he had no problem with my continuing with the LAc treatment protocol! My ophthalmologist showed me that 3 months ago my visual fields test wasn't just "no worse"; it was "borderline normal." So, I will continue with the LAc protocol, and my ophthalmologist will do an optic nerve test in 6 months and a visual fields test after that. For those of you who do TAT, the eye points include a quick in and out at Bladder 1, two of the points in the TAT pose! Thank you, God, dear sweet TAT friends, Jasmine Patel, MSAOM, LAc, Dr. Rebecca Neborsky (who referred me to Jasmine Patel)! Thank you to my ophthalmologist for accepting the reality of the unexplainable (to him) change in my eyes! <http://www.youtube.com/watch?v=j0zMG4mfHZk> And be sure to check out the section about Anita's book below! July 31 and November 2nd, 2012 my optic nerve showed no change. Wow! Music is everywhere uplifting the planet. These boys sing with such heart and majesty! Their name, IL VOLO, means "flight", and to listen to them, I feel like I'm flying! And, yes, you can purchase on iTunes. They earned a Platinum record in 6 months in Italy! And Quincy Jones invited them to represent Italy on the single We Are the World 25 for Haiti. IL VOLO with their biggest, and very young fan Mia - so precious! I love how all 3 boys are even more present and so sweetly gentle with little Mia. The song they sang: "Can't Help Falling in Love". <http://www.youtube.com/watch?v=I89avIqKEkU> [REMOVED DUE TO COPYRIGHT] Just so you know, this one has a few screaming teenagers in the audience. But think about it: aside from the teens, no doubt, excited by how cute these guys are, they are cheering for phenomenal quality music and clean cut young men who understand teamwork, dedication, and caring. That's my kind of teen role model! Here is a great 4-part FaceCulture interview with IL VOLO from December, 2011: <http://www.youtube.com/watch?v=4rbne2LHFZg> and search for "Il Volo face culture interview" for parts 2-4.
video sampling of their March, 2012 PBS Special "IL VOLO Takes Flight" ~ what a night to remember! 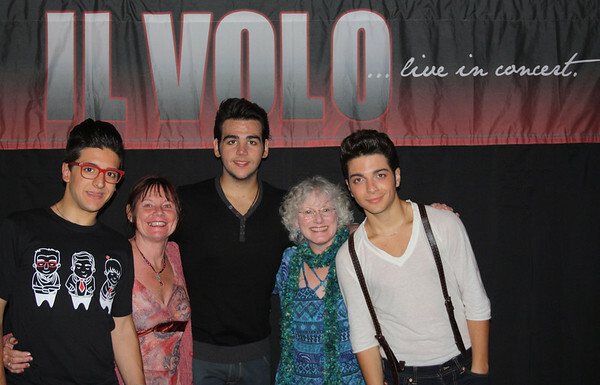 incredible IL VOLO concert in Seattle October 2nd 2012! The music was soooo phenomenal... It sounded as if every air molecule in the theater was resonating with the glorious sound of their voices! Ignazio's rendition of "Memory" from the musical Cats, a power-packed home run! Piero's powerfully rich version of the Love Story theme "Where Do I Begin"
Gianluca's beautiful and deeply heartfelt presentation of "Maria"
This rendition of "Magnificat" with the boys and Italian actress Arianna Bergamaschi was magnificent. We really hear Gianluca's baritone register! My friend Peta and I were blessed with a special surprise invitation to join the boys in their Meet & Greet after the concert! Here's their official photo link with a closer version shown below. I just discovered Luna Nascosta <http://www.youtube.com/watch?v=_0Ft10p7iWM>, which the boys recorded for the film Hidden Moon. Spectacular! More fun! IL VOLO singing with Barbra Streisand. I love hearing that Barbra heard them on a TV special (PBS?) and called up to invite them to join her on her tour! To be honest, I had listened to the available songs (from their new CD) by other artists on YouTube and iTunes. I wasn't too excited by the other renditions, but I trusted that IL VOLO and their sound engineer team, headed by Humberto Gatica, would make magic out of some songs which had yet to be done justice. WOW! My trust was so well-founded! All are delicious! Check out Questo Amore (I Don't Want to Miss a Thing) on Fox December 5, 2012 <http://www.myfoxny.com/search?vendor=ez&qu=il+volo> High definition images and lots of smiles from the boys, not to mention their amazing voices! The brief interview (part 2) is also quite sweet. Here's the lovely and revealing bio of IL VOLO on the Nobel Peace Prize Concert website (as the boys were among 11 performers at this 2012 concert!) <http://www.nobelpeaceprizeconcert.org/artists/il-volo-2/> I love that Placido Domingo's grandson is an enthusiastic fan of IL VOLO and encouraged Domingo to join the boys in singing IL Canto on their latest CD "We Are Love". Thank you so much for your loving hearts! Whether you are sharing your prayers for the Children and Staff at Sandy Hook Elementary or opening your loving musical hearts at a concert dedicated to honoring the Nobel Peace Prize winner or representing Italy in We Are the World 25 for Haiti, you are ambassadors for world peace. And world peace begins in each heart! Tonight I was visiting a friend in the hospital (and doing some Healing Touch). She was in the hospital to deal with health concerns for her heart which, thanks to God, the doctors have found a good stabilizing medication, and she is so much more peaceful today than yesterday. We ended the evening with her cozy and snuggled in bed, listening to your IL VOLO rendition of Silent Night and Panis Angelicus. She had the most peaceful smile on her face as she drifted off to sleep. Thank you again, guys, for your awesome spirits and love! IL VOLO is so much more than your utterly incredible voices. Your hearts amplify every note and carry the joy, peace, and love around our dear planet earth, and tonight especially to Newtown, Connecticut. Ignazio speaks about losing 75 pounds <http://www.youtube.com/watch?v=10c3Idm5zE0> I love how open and genuine these boys are! <http://www.youtube.com/watch?v=KuK8KKRc8qg&feature=endscreen&NR=1> Whew! I confess I cried the first time I watched this. My cat even came over & hugged me. I've heard IL VOLO sing We Are Love & IL Mondo many times (in my car, my iPod, my house - yes I LOVE their music and their great wide open hearts! ), and... seeing them sing at the Nobel Peace Prize Concert... they are bringing HOPE, LOVE, PEACE to our world. Our world sometimes seems so broken, and yet one heart at a time, We ARE Love. We need you, IL VOLO!﻿ Grazie mille! Touching to hear the boys 1:25 minute interview with the Nobel Peace Prize Concert folks about spreading the global peace message through their song "We Are Love." I had a vision of Gianluca, Ignazio, and Piero singing for the kids and staff of Sandy Hook Elementary School in Newtown, Connecticut. Maybe that's not doable, but here's the thing - even if IL VOLO (and all of us) simply envision our voices, our songs, our love, filling their halls, comforting their hearts, just like prayer, it﻿ WILL change the space. The air will be thick with our harmonious warm love. Let's do it! IL Mondo chosen for slow Waltz competition at World Dance Sport Federation 2013. Check it out: the dancers are singing to the music! I remember how touched I was when I saw this Occupy poster. This 5 minute YouTube video beautifully illustrates this concept and embraces a sense of community for all and personal contributions, as opposed to any "us versus them" mentality. The Occupy movement has been a fluid process with many expressions. Thus far, I most honor and align with Charles Eisenstein's expression of the meaning of the Occupy r-evolution. Interesting how that word revolution seems to be a "re" (return to or again) evolution. I feel so blessed to have discovered this song (also on iTunes), which speaks the heart of my dream (since I was a child) for our beautiful planet and all Creation. It looks like Yvan Eric Cassar and Eric Levi wrote this song. We are so blessed by all the artists birthing this. To join and to care for love. And giving our love we'll make heaven on earth. We envision a world where love is the answer to all questions. Now that each and every one of us know in our hearts that love is the feeling that supports the highest good of all mankind, we allow ourselves to give it without hesitation. We see that when we give love we trust and respect everyone, we are unselfish in our desires, we treat everyone as we wish to be treated, and we speak and act with gentle hearts. Because we understand how important love is we always consider the feelings of others by being aware of the impact of our actions and words. No one is lonely in this world because we all freely express our love and gratitude to each other for our co-existence on this planet. We love each other, we love the animals, we love the plant life, and we love God. No one is jealous of another as they are overflowing with the love that is sent to them each moment of their lives. There is nothing that we cannot handle now that we are sure that we are supported by the love of the Universe and all of Its inhabitants. Now that we know that all beings are motivated by loving kindness we feel safe, secure and peaceful in each other's company. Our love which is for the highest good of mankind knows no boundaries and everyone is aware of that. There are no questions, no doubts, no fears, only LOVE and ONENESS. Thanks to the Vision Alignment Project <http://www.visionalignmentproject.com/> for this sharing! At the time I clicked "Yes! I align with this vision", there were 567,883 people who had already indicated that they align with this vision of Love Overflowing. Isn't that encouraging? I invite you to check out their project (link above). I find the visions very uplifting, whether I look at them every couple days or save them up and then choose the one which speaks to me on the occasion. Thanks to Barbara for sharing this. What a great opportunity to take 6 minutes and 37 seconds to be fully present with the glory of Creation and honor the possibilities of this new year. The joy of ONE-NESS and unconditional loving - as told through Anita Moorjani's Near Death Experience and rapid transformative restoration from 4B lymphoma cancer. And thanks to this interview with Lilou on the Juicy Living Tour. <http://www.youtube.com/watch?v=tjLouLHH-_I> Although this YouTube video link was actually emailed to me 4.5 days ago, I only just watched Anita's story. Ahhh... synchronicity! (; >) Perfect timing! Right after I had an amazing BodyTalk™ session that was about letting go of fear and traumatic cellular memory, about being re-calibrated for my true self (even my 5 senses and the 5 subtle inward senses), about letting go of the illusion of separation, adjusting my energy body for a healthy flow, and more. I am so very grateful to God, myself, and Laurie (my BodyTalk System Practitioner™) for today's session. For the check memo, I actually wrote "BodyTalk for a new life". And so it is! I totally love how Anita's experience reflects so much of what I believe, in ways that bring me joy and hope for my life and our world. So, here is Anita's website <http://anitamoorjani.com/> and her book Dying to Be Me (is that not a great title?!) was released March 1, 2012. Already the audio book of Dying to Be Me is available. Way to go, Hay house! Anita Moorjani was on Wayne Dyer's PBS Special entitled Wishes Fulfilled in March 2012. Now Available! Group reading Dying to Be Me or to participate in TAT group sessions (conference call) on whatever surfaced through your reading of Anita's book. <http://www.compassions-doorway.com/TAT_Anita_DyingToBeMe.html> Check out the video, as well. I sent an email of appreciation to Anita about how her inspiration was a factor in my healing from glaucoma, and I also shared about these events and the videos I made. Anita has given me permission to share her response. Here it is. Thank you so much for your messages. I saw your videos and am truly touched! Thank you so much! Also I'm so happy to hear how my experience has helped you. I agree with what you say about the reason for the glaucoma is from feeling blind sighted. Sorry my response is so brief. I do read every email but am perpetually traveling these days (sometimes with limited internet access) and have to resort to one finger typing on my iPad when I do respond! But your messages, website and videos truly moved me and I felt compelled o reach out to you and let you know that. Keep doing what you do fearlessly! And below is the entire insight-filled 38-minute interview, a year after Lilou's first interview with Anita! Wishing each of you blessings as you enjoy Anita's story. May we grow in recognizing the beauty of our true selves. We need every being on this planet! There are no throw-aways. We need the talents, passion, heart, and uniqueness of each of us. Here is a homeless boy from Korea, Sung-Bong Choi, singing beautifully. I honor you, Mr. Sung-Bong Choi. Your voice, your spirit, your resilience, are a gift to our planet, a reminder of﻿ the power in each person following his passion & choosing life & joy. May you grow in hope, joy, & feeling loved & valued for your true self. May life transform your early memories & lift your spirit daily. I am grateful to post your song on my Reflections Page. Well, looks like I'm behind the times on discovering this. And yet, several members of my Quaker Meeting are planning on making another medical support team trip this spring, so the need is certainly still there. If what you're doing isn't working, try something else. Shortly after we went our separate ways, I called one of them to say, "Yea! That was so fun! Thank you so much!" at the very time that my phone read 7:33 (3 is my number for God) and I saw another sign with 444 (4 is my number for the heart). That's what I call a cosmic wink! Then I went shopping to get another pair of those cozy black velour pants I had gotten the day before. Well, they were out of my size, and the 2 stores they called had my size on the computer but not on the floor. (Although I've never done such a thing before, I really was willing to drive across town for those pants!) So, I decided to check another store in the mall. No luck. Back to the original store. I remember how there was a different style (and not a warm velour) in my size on the rack. Suddenly I thought, Hmmm... if that one was in the wrong place, maybe "mine" was also. Sure enough! Two racks over, there was exactly my size on a non-velour rack, just waiting for me to pick it up. It's as if the misplaced pair was there to spark my imagination and give me a clue on my treasure hunt. Yea! Off I went to purchase my cozy winter pants. And then I thought of others who were looking for just the right item, and I put "their" misplaced pair on the rack where it belonged. Anything is possible as I stay open to the surprises of life. A new favorite written by Peta Lynne and produced by a friend: "You don't have to be dead to move towards the Light." Another favorite: "If you lived in your heart, you'd be home now." "God is too big for any one religion." "I know if one door closes, another opens, but it sure is hell in the hallway!" - Thanks, Kathy! <http://gugstenors.co.za/> I think you will be blessed by their video and by reading their profiles in "Meet the Tenors." They have a CD (Gugulethu Tenors), and their songs are on iTunes! I've already downloaded "Nyamezela", a beautiful original piece which means "Persevere". I love to see folks find their passion and glow with the beauty of their true selves. My heart is full as I bask in the glory of this music. I wish them great success and joy as they grace our world so richly. I discovered their song with English subtitles on YouTube - encouraging words, too! After many sweet days, today was another rough one, in part the dark grayness of the sky, and just a whole collection of other challenges crowding in on this week. After quite a while the bright yellow faded, and then there were glorious pink clouds, which I quickly went onto my deck to photograph. When I came back in, both my kitties were sitting at the screen door. That brought a smile to my face as I remembered the sweet summer days with kitties drinking in the warm fresh air. A little later my friend whom I was emailing called me, and asked how I was (as I had left her a phone message earlier). I told her about the amazing sky, and she said, "Well, then I have something to tell you!" I was praying for you, and right after I prayed, I came around the corner, and there was the most glorious bright sky and gorgeous pink clouds. I felt nudged to call you and tell you about those magnificent clouds and how in my country of origin, we say, 'The angels are baking!' But when I got out, it was dark." And then she told me that the forecast is for 7 days in a row of sunshine. Wow! For Portland, Oregon in November / December, that's spectacular! It wasn't until later that I realized I was writing her the email while she was praying for me and the sky was transformed. So, here's the picture of angels baking these glorious clouds. Had a tough day today... for a while. Something hit me so hard, and I was sobbing for over an hour. I wasn't sure what was going on. Apparently something that dates back to ancient history, beyond anything I could put words to. I came home to rest and recover from the intensity. As I got out of the car, I saw one geranium petal had fallen from a flower and was resting on the ground. It was the shape of a perfect heart. Wow! Reminds me of our story about God putting a rainbow in the sky. Same kind of thing. That special reminder that I am loved. I put the petal on the stool next to the couch as I fell asleep. When I woke up, my water bottle, also on the stool, was reflecting the sunlight through the bottle onto the heart shaped petal. I took lots of photos. A few I cropped or softened the edges of the image. Other than that, this is simply a geranium petal. Also today, later on, I went to visit where I volunteer in a cat adoption shelter. This one very special girl (yes, cat; I'll call her Sweet Pea) had been waiting to be adopted by a gentle soul I'll call Laura. Laura had fallen in love with Sweet Pea the day she met Sweet Pea 2.5 years earlier! Laura had waited until her current cat had been given the grace of every last drop of personalized love and attention, her cat now more than 20 years old! Meanwhile, Sweet Pea had patiently hung in there for 2.5 of her 8.5 years of life, waiting to be adopted by this one dear heart whom she, too, had fallen in love with. The day before, I had invited Sweet Pea to join me in sending love to Laura. Sweet Pea didn't hesitate! She started to purr and purr, and within 5 seconds, she was purring louder, longer, stronger than I had ever heard her purr, at least 3 times as strong and as loud as any purring I had heard from her sweet arthritic body! Oh, my! I felt how very deeply she loves Laura. A love so deep that she waited a quarter of her life in a shelter, so that she could be with her beloved Laura. What love they both have for each other! Love like the glow from this simple geranium petal. So today, at the end of this incredibly intense day, I decided I needed to drive out to the shelter to brush Sweet Pea and together to send love again to Laura. But when I got to Sweet Pea's room, she wasn't there. How odd! Not under the cubbies, not way on top of a shelf, not in one of her favorite beds. I immediately inquired, What happened to Sweet Pea?! The wonderful shelter worker looked at my confused face and said, It's a good thing! Sweet Pea got adopted today! Laura adopted Sweet Pea today! To me, it's like Sweet Pea's purr was a beacon of love to her dear Laura. Color, shape, texture, design... whew! I've never seen one river with so many amazing, vibrant nuances. This is just one. Here are more images for you to bask in the glory of this vibrant river! At the banks of the Metolius River I discovered a new level of quiet within myself. Hmmm... Do you remember? Where were you back when? Did you watch wonderful throngs of people arm in arm down by the railroad tracks singing We Shall Overcome, and did you sing it, too, in your heart? ...I did! Today I was reminded of George Harrison's song My Sweet Lord and the Christmas that I sat cross-legged on the floor singing it for hours, my eyes closed, my heart full, the Christmas lights coming through the drapes with a beautiful glow. Yum! What sweet memories. A good beginning. Thanks to iTunes, I'm listening to these beautiful tunes right now and wishing all that they carry for our world today. Imagine giving peace a chance, ebony and ivory living together. I've held this dearest hope in my heart as long as I can remember and done my best to contribute to this path. My sweet Lord, give us peace on earth, peace in our hearts, peace with our neighbors, peace with all Creation. Check out John Lennon's Imagine being sung by Emmanuel Kelly in the X Factor 2011 ~ What an amazing, uplifting, heart-centered performance and touching life experience of Emmanuel and his family! Oh, and just to put my own spin on this, one definition of Emmanuel is "God with us." I feel that in my heart when I listen to and watch Emmanuel sing. What a blessing he is to our planet! And here's Yoko Ono's Imagine Peace site with a message to Emmanuel from Yoko Ono (John Lennon's wife, for you young-uns) as well as an article from the Herald Sun about Emmanuel. I just discovered this Today show piece on Emmanuel Kelly, along with commentary from his mom Moira Kelly (of Children First Foundation). Observing Laughter's Effect on Our Personal Energy Field ~ What fun it was to serendipitously observe laughter's effect on my client's field! I was doing a Healing Touch technique called Magnetic Clearing, which helps remove debris from the individual's biofield. The field was certainly clearING but felt a fair ways from being entirely clear. (It often takes around 30 passes over the body before the field is entirely clear.) Then I said something that came out funny, and we both laughed a kind of light sweet laughter as I was walking back towards the top of her field (her head / crown). When I started my next pass, her field was crystal clear. I did another pass, and it still was squeaky clean. Very cool! (; >) Clearly, the laughter caused the rest of her field to clear instantly. I've never seen this before. Sure reinforces the value of laughter! Hmmm... remember when people used to read the comics every day? I just read an article from Andrew Weil, MD, called "How Laughing Fights Pain." Interesting additional connection. Here's the link if you'd like to read Weil's article about the Oxford University study. • Miraculous Glories! ~ Flying home and just needing a little uplift, I saw out the airplane window the most incredible mountain peak poking through a sea of clouds. I asked around and learned that it was Mt. Jefferson. Unfortunately, I did not get a photo of it, but tonight I went looking on the web and found this magnificent beauty by D. H. Parks. Just one of those days when I needed an uplift, and the glory of Creation jumped out at me and left me in utter awe and joy. Thought they might put a spring in your step, too. Sky Paintings by a Friend from Beyond the Veil on His Birthday ~ Ask me about these photos. The story is a wild one with many beautiful and curious facets. Some day I think a few will grace a book. For now, you might need to look in my eyes to know I'm speaking the truth from my heart. I'll give you one hint. If you can enlarge the fourth image below, you will see a detailed portrait of a man's face. Cindy recognized her dad. The other (primary) sky artist is perhaps less life-like in his images. And then there are the orbs.... These pics were taken between 4:30pm-5pm on July 22, 2010, and the sky artist gave me a head's up to go look for them. Here are just a few to entice you to look at all 64.
organized by the Earth and Spirit Council <http://www.earthandspirit.org/>. I feel greatly blessed by the work of the Grandmothers and of the Earth and Spirit Council, to have seen the film, and to have a glorious rainbow and vibrant skies punctuate the evening with their grace. <http://gallery.me.com/duboisj#100127-THIS PAGE TEMPORARILY OUT OF SERVICE*> Images 1362 to 1382 were all taken that evening. Scroll down to the rainbows. Bald Eagle! ~ What an incredible day! A long lovely visit with a friend was capped by the most amazing bald eagle who flew over us and soared so gracefully. We were sharing stories about our husbands finding peace before their death, and right then was when the eagle flew over us. Wow! Amazing Diversity ~ Just as the diversity in people and animals is beautiful and amazing, I'm discovering the same of clouds in the sky. I keep adding to my album of cloud images. The 9 photos following my Sky Collage were all taken within 1 hour of each other. Oh, what the heck! I just posted a few here to show only a sampling of the diversity. Everywhere I look is amazing. Color, design, life, the art of Creation. Beautiful Walk ~ Amazing! I walked the same path as yesterday, and look how incredibly different the images are! Beauty every day. Different every day. Always good. Always God. • Sunset Majesty ~ Wow! Out for my walk this evening, visiting with a friend, each sharing about spectacular and quietly unfolding miracles in our lives and those we love. The backdrop of the sky, frothy peach and slate clouds were nebulae of glorious color. Awe struck again! Today a garland of feather clouds in the sky stretched from one end to the other, as if to enfold me and anyone who had eyes to see. Airplane Trails ~ <http://gallery.me.com/duboisj#100099-THIS PAGE TEMPORARILY OUT OF SERVICE*> Mysterious and magical, these trails all appeared in the sky within an hour. At some moments there were 8-10 airplane trails visible simultaneously. Most sets were concurrent, like the 3 X's in the sky. (I took multiple snapshots of some.) There were also 2 simultaneous airplane trails (at the time of the 3 X's) that spanned the entire wide sky from horizon to horizon. Two days later I accidentally took a picture of a parking lot, and it was the same geometric image. Two days after a dear friend died, another friend and I watched this apparition in the sky for 20 minutes. When I returned home, I was finally able to easily download the song I had attempted to retrieve before our lunch, the song by Foreigner "I Want to Know What Love Is." Then I discovered the line "Through the clouds I see love shine." It wasn't until I looked at my computer image of the sky that I noticed the 8 (infinity sign and symbolic of abundance) in the beam of light, the beam that clearly was not a cloud and was not an airplane trail. At the gallery sites, click browser back arrow to return to this page. *While I'm transitioning the gallery sites to my own web page galleries, some links are temporarily out of service. Tapas Acupressure Technique and TAT are registered trademarks of Tapas Fleming, being used with permission.